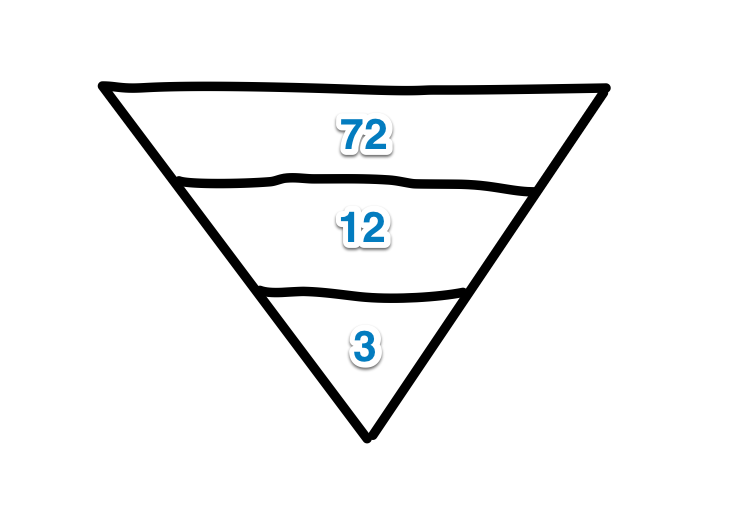 At a team offsite nearly a year ago James Ward talked about his Pyramid of mentorship. His process was essentially having three levels of which you’re working to grow and cultivate these people or in some sense your general network. These three levels drop off with the frequency and depth of engagement more at each level. At any given time there would be 3 people he was heavily mentoring, 12 he would frequently work to cultivate heavily, and then an outer 72 that he’d still consider in his circle. For a few years I’ve followed a similar process to this. Essentially creating advocates is done through first making them successful, then empowering to talk about their success. I’ve often done this by giving people a private channel to me – through IM, SMS, Phone, Skype, or even in person. Sure its easy enough to get my work email address, its a pretty easy one to guess, and even at that address I do aim to respond to every request. These channels in reality don’t make me more available; but they do allow a different type of communication to happen. My personal approach has found it more out of place to ask how someones weekend was over email – IM or Skype make this easy. Broader questions of how someones actually doing in life generally are much easier to do over a coffee or a beer. This allows for a deeper relationship; at the same time I can ensure everyone I interact with is successful. It’s easier to ensure someones successful if they’re willing to talk to you, actually connecting with people enables this. Once someones been successful theres usually some value in their story. This doesn’t need to come in a marketing-ese approach though. Instead contribute back the value of what you did to the broader community with clear steps how they can get the same benefit. For many developers they feel talking about their own success is a bit of imposter syndrome. While this isn’t always the case; if it is you can help to work with someone to highlight the value in what they’ve done. This could be as simple as some encouragement to actually helping review drafts of blog posts. Of course once someones started talking about what they were able to accomplish help them celebrate the success. Yelling from the rooftops only helps to further their efforts and give them the confidence to do it all over again. To create advocates you don’t have to write a list of people you wish to shoot for, but realizing there are limiitations on your time can help you be more intentional. Knowing that where you spend your time and who you spend it with has a cost can allow you to be more explicit about ensuring you’re providing value to them, from there it should naturally run its course. Want to discuss this more? Email me at craig.kerstiens at gmail.com.